"The Vigorous Militant Emperor 武烈帝 (wǔ liè dì)"
Best known as the father of Sun Ce 孙策, Sun Quan 孙权 and Sun Shangxiang 孙尚香, Sun Jian was one of the warlords who took part in the early coalition against Dong Zhuo 董卓. In fact, Dong Zhuo and Sun Jian were bitter enemies even before Dong Zhuo took control of the imperial family. One significant event in the life of Sun Jian was finding the imperial seal in a well in the palace ruins at Luo Yang 洛阳. Sun Jian wanted to keep the seal for himself and, thus, control huge power within his grasps. Unfortunately for him, he was betrayed and Yuan Shao 袁绍, then the leader of the coalition, confronted Sun Jian. Sun Jian vehemently denied having the seal, but Yuan Shao was convinced he was lying. Yuan Shao sent Liu Biao 刘表 to intercept Sun Jian, and it was under Liu Biao that Sun Jian's life met an abrupt end. Character ability: "Heroic Spirit 英魂 (yīng hún)"
1. Pick another player to draw X cards, and then discard 1 card. 2. Pick another player to draw 1 card, and then discard X cards. (X being the units of health you have lost thus far). 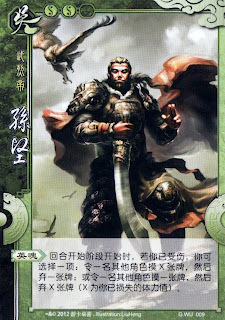 The name "Heroic Spirit" should not be taken literally, but instead metaphorically describes Sun Jian's contribution to destroying Dong Zhuo. Being the first in the coalition of 18 warlords to attack Dong Zhuo, Sun Jian almost lost his life to Hua Xiong 华雄, but his initial strike was enough to cower Dong Zhuo and dampen his army's morale. Even after Sun Jian's death, the lessons learnt in his early attacks against Dong Zhuo served Dong Zhuo's enemies well. Thus there is a link to the ability with Sun Jian suffering damage first, yet able to leverage on that to assist his team mates or disconcert his opponents.